What’s a 3DR radio ? 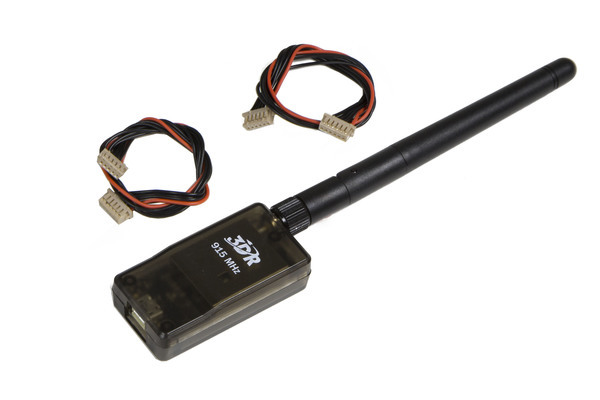 3DR radio is a product from 3D Robotics which provides a telemetry link, and is often used by APM users. It is sometimes sold as a combo with APM. ULRS : 400mW, can easily be modified to 1 Watt. 3DR radio : $100 for two modules. 3DR radios : only a telemetry link, RC must be transmitted by another mean. ULRS transmits telemetry linke and RC signals. RSSI is an indicator of signal strength : it allows to know when we are at edge of reception. ULRS provide RSSI on the TX and on the RX, which can for example be shown on an analog meter, a voltmeter, or an OSD. ULRS provides an acoustic signal when a packet is lost, which gives a real time feedback of the link quality (for long range). 3DR radios have built in USB connectivity, while ULRS requires an FTDI (USB to serial) adapter. 3DR radios has a sensitivity of -117 dBm. ULRS has a better sensitivity of -120 dBm. The power difference of 10 dBm (1000mW = 30dBm) – (100mW = 20 dBm), and the sensitivity difference of 3 dBm (-120 dBm – (-117 dBm)), makes a total difference of 13 dBm, which gives ULRS a range of more than 4 times the range of the 3DR radios. Good antennas allow to go even further : a user reached 40 km with Ultimate LRS. I really like your proyect. Im planing to use it in my new build using a joystick in my pc. Does it have any lag on the controller?? I found 3rd radio way to slow for controlling my plane. Are you planning to sell a plug & play kit?? To use a joystick there are several lags that sum up, the main one is that Mission Planner will not send 30 mavlink packets per second with the joystick positions. I don’t know exactly the figure, or even if it’s configurable, but that’s the main issue. Notice that if you find a way to convert the joystick into PPM input, you can simply send the PPM to ULRS and it will be forwarded very fast. In theory it should be possible with a simple arduino due, which can act as an USB host, read the joystick position and translate it into PPM. If you’re interested in this or want to hear other options please join the rcgroup thread. Thanks for your reply. So the lag will be the same becouse mission planer is the causing it? Im not a expert in computers but it would be strange that a software running on a quad-core computer for example would have lag. At least this should be possible to correct in future MP software vesions?? I checked in the Mission Planner code, it’s sending joystick values every 50ms, which is not too bad and should not generate a very noticeable lag by itself. On the radio side I would recommend to try with ULRS because it’s much faster than 3DR radio, (in addition to be 10 times more powerful). Grate news! It would be helpful if you could make a video comparing this lag between the two radio systems. I have read that many users are planning to do the same thing. I think this could be a strong caracteristic for using ultimate lrs! It’s a good idea, I’m adding it to the todo list. 3DR radio use ECC (error correction code). This ECC adds link reliability (and distance), with the price of overall data traffic and latency. Please, does ULRS use some kind of ECC in data transmission? I didn’t implement a forward error correction such as Golay in ULRS, because it would reduce the throughput by half. I consider this is only useful for some applications where any missing packet is visible such as HDTV transmission. But here the loss of several packets is invisible : maybe the transmission of a packet containing GPS position will be delayed by 100 ms and that’s it. In addition given the ULRS power is “1W”, it has many less lost packets, and much higher range than a “100mW” system such as the 3DR radio. But I’m curious and could consider trying a Golay FCC.